New York's 39th annual Village Halloween Parade was an event for more than 50,000 participants, and an estimated 2 million attendees, as Gotham’s already-expressive denizens shed what inhibitions they had left and let their freak flags fly. 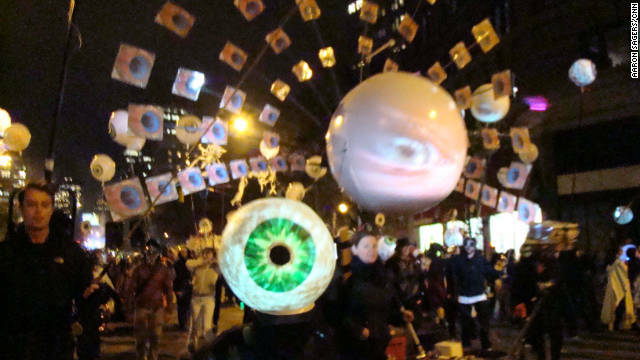 Two days after a snowstorm kept many indoors, Monday's mild evening brought the masses outside for the anything-goes – and anyone can join in – parade that included giant puppets, bands, dancers, floats and costumed revelers. Officially taking place between 7 and 10:30 p.m. and running on Sixth Avenue from Spring Street to 16th Street in Manhattan, the parade was also the launch of a party where thrumming throngs masqueraded throughout the city late into the night. Billed as the nation’s largest public Halloween celebration and only major night parade by organizers, the event is run by a not-for-profit organization – Village Halloween Parade Inc. – that receives funding from local and state government, arts associations and large corporations. Much like the diverse collection of funders, the parade itself was a metropolis melting pot of ideas, styles and missions where attendees played dress up in costumes that show off a sense of humor, pop-culture awareness, nerdy inclinations – and, frequently, ample amounts of flesh. And you thguoht that I'm busy? Whew! Love all your event photos and the night shots... stunning!